Welcome To The WBSA, Inc. 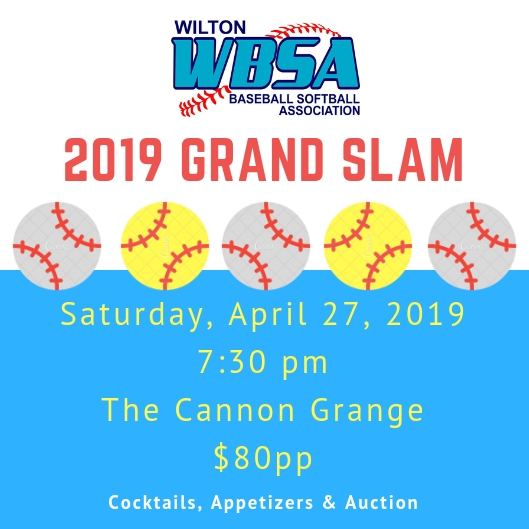 The Wilton Baseball & Softball Association, Inc., or WBSA, is a volunteer organization designed to support the Wilton High School baseball & softball programs. Additionally, the WBSA provides playing opportunities in the Spring, Summer and Fall for Wilton youths in Baseball for those boys who have grown out of Little League (age 13 as of 4/30 of the current year and up) and for girls as young as 9 years old who want to play travel softball in the summer and fall when Wilton Little League Softball programs are not available. Working year round, the WBSA strives to provide a quality baseball and softball environment in Wilton for our youth. If you are currently a WBSA member, please go into the personal profiles of all of your family members set up on this web site and ensure that under CONTACT you have not checked the "NO EMAILS" option. If this is selected, you WILL NOT RECEIVE ANY EMAILS OR ANNOUNCEMENTS FROM WBSA about teams, schedules, open registration, deadlines, etc. It's Time For the GRAND SLAM!!! IT IS TIME FOR THE GRAND SLAM!!! If you are registering for a WBSA program for the first time, you need to enter your 'member' information into the site. To do this, go to REGISTER ONLINE on the left menu and select the desired program from the list (you may need to scroll down). Then, enter your email address. The system will automatically send a temporary password to that address, with which you can log on again and change your password to something that you can easily remember. When creating your family memberships on the site, please remember to enter PARENT information first, before that of your children. IT IS TIME FOR THE GRAND SLAM!!! TICKETS AVAILABLE HERE! !